The 27/28 St crosstown would be useless. It would only run between 2(nd) and 8(th). At least routes like the M8, 50 and 66 run end to end. The streets are too tight for a bus route on that street plus the NIMBYS wouldn’t even accept this. M9- bus is rerouted to Worth Street after East Broadway. Bus then runs on Lafayette/Centre to Chambers, and from there it runs on Chambers to West Street where it resumes its normal route. M22- route is eliminated (if feasible). I’d leave the M22 and make necessary modifications within the lower east side portion and possibly extend to 14th and 1st or 23rd and 1st. Worse case scenario. 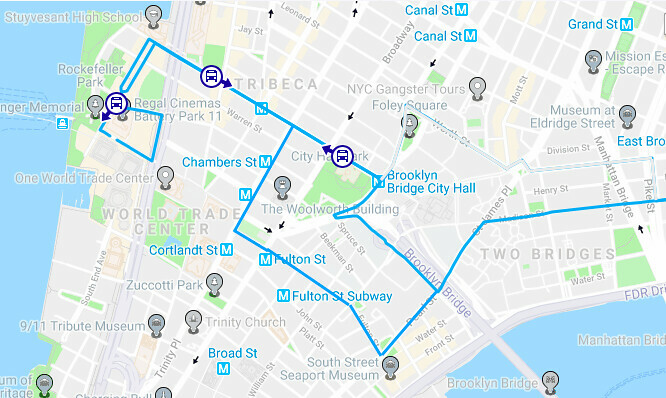 Battery Park to City Hall(M22) and the Chinatown-Lower East Side to be serviced by a new route: M29. The only thing I would do with the M22 is expand the service span especially on weekends. Didn't the 22 run the entire length of Madison St in both directions pre-9/11? Before I forget, no to a Grand-Canal crosstown. In addition to why an "M28" wouldn't work nothing of interest and no adequate layover space. To keep it strictly Lower East Side, I’m in agreement of a possible extension to Baruch Houses on Delancey and Houston with the M14D, M21. The current route’s last stop is not to far from this one. I believe pre 9/11 it did run on weekends and also on Madison Street for entire length. ....In addition to why an "M28" wouldn't work nothing of interest and no adequate layover space. ...Didn't the 22 run the entire length of Madison St in both directions pre-9/11? (Madison Street). I get your drift. To get the M22 out of worth/Lafayette. The following must be done. Buses to travel via Madison street. Left on St. James/Pearl Street, right on Fulton to Broadway & WTC. (This would be an interesting terminal part time). Option #2. M22 serves financial district loop to Fulton and Broadway than left on Chambers and regular to BPC. Thoughts? PS: I feel there is a viable market for the M22 Downtown, Lower East side, BPC if structure correctly and service to end at 12:30AM M-F Sat/Sun till 1AM. Option #1 - Buses to travel via Madison street. Left on St. James/Pearl Street, right on Fulton to Broadway & WTC (This would be an interesting terminal part time). Option #2 - M22 serves financial district loop to Fulton and Broadway (then left on Chambers and regular to BPC. Yes. M9 to Park Row-City Hall. M22 direct to BPC with part time term to Vesey/Church/Park. So M22s from the Lower East Side would alternate Vesey, BPC, Vesey, BPC? Didn't the M22 did that in the early 2000's with short trips to Foley Square? @Future ENY OP @B35 via Church is this what you mean by the M22 via Fulton St? Yes (it's too narrow)... Which is exactly why I prefaced the idea the way I did. If St. James Place counts as Foley Square then I believe yes. Bad news. It doesn’t. You thinking more of the lines of Worth Street and Centre street for Foley Square. I don’t think there was ever a short turn from Foley Square for the M22. Maybe for City Hall. There’s no parking in the area of Foley Square. Why was the M10 shortened? It was a dumb idea. I say restore the M10 to where the South Terminal is Abingdon Square, and extend the M20 North to West 96th Street - Central Park West. Then put Artics on the M10 at 5 minute headways at Peak Hours, 6 minute headways at Middays and Weekends, and 8 minute headways during Evenings, while Standard Sized buses run on the M20 every 6 minutes at Peak Hours and every 10 minutes during Middays, Evenings and Weekends. Times Square is an inappropriate terminal for the M104. Send it back to the UN, and restore the 3 to 4 minute headways throughout the day. It was﻿ a dumb idea. I say restore the M10 to where the South Terminal is Abingdon Square, and extend the M20 North to West 96th Street - Central Park West. Then put Artics on the M10 at 5 minute headways at Peak Hours, 6 minute headways at Middays and Weekends, and 8 minute headways during Evenings, while Standard Sized buses run on the M20 every 6 minutes at Peak Hours and every 10 minutes duri﻿ng Middays, Evenings and Weekends. Again. Why? First of all the m20 is a horribly unreliable route with pretty mediocre ridership as it is. Extending it another 30 blocks north will trash it's reliability even further, and it's not like the extension will justify a 6 minute frequency. In some cases increasing frequency attracts more riders but the M20 is so hopeless in midtown and so convoluted in the financial district that the route would need to be completely rethought to justify 6 minute frequencies. Not to mention you could just ride the 1/2/3 train.. It was a dumb idea. I say restore the M10 to where the South Terminal is Abingdon Square, and extend the M20 North to West 96th Street - Central Park West. You might as well bring back the old M10 from 159th to BPC. The main reason it got split was that buses never got uptown due to the congestion around the Holland Tunnel. I like that idea. Just too much traffic in Midtown. That's why it became the M10/M20. How many buses per hour, on average, do the Manhattan bus routes run, please? Thank you. If you have any specific routes in mind, just look at their schedules. There's a detailed report from the comptroller's office (2017) listing bus route frequencies in the AM and evening. Note some parts may be outdated. Manhattan, on average, seem to run 9bph during the AM rush and 4 bph during the evening, which is the same as the citywide average. So the AVERAGE average would be somewhere in the middle.